Melbourne's eastern suburb, Blackburn, has seen an increase in residential developments following planning changes which have enabled urban renewal. City of Whitehorse local government area, has undergone a rapid transformation after a 2010 planning policy change. The changes divided the area into separate activity zones to ensure new development made the most of available land in the area and utilised height where appropriate. The changes pre-date the Victorian State Government’s proposed planning reforms, which are also designed to create growth zones for residential development within each municipality. Hayball is playing a major role in the Blackburn renewal, designing three projects on Queen Street. Local government allowed greater density and more affordable living in the Queen Street area. Hayball designed a 48 apartment building for developer Kokoda at 2-4 Queen Street, which was completed in October 2013. The building comprises of 31 one-bedroom apartments, averaging 42 square metres and 17 two-bedroom dwellings averaging 60 square metres. Hayball Director Luc Baldi said the planning policy changes in the region had delivered a more diverse and affordable range of housing choices for buyers in the suburban environment. “The more affordable apartments can help the younger generation get a foothold in the property market," Mr Baldi said. "It also allows empty nesters to downsize in their own neighbourhood, helping them to maintain their relationships and connections. Mr Baldi said there were now about 250 dwellings built or approved on Queen Street where once about 20 traditional dwellings stood. Kokoda Managing Director Mark Stevens said the development had allowed a diverse range of buyers enter the property market. “Local and offshore investors, as well as owner-occupiers, have been considering apartments in the precinct,” Stevens said. Construction on Hayball’s second Blackburn project at 20 Queen Street has 50 one or two-bedroom apartments. 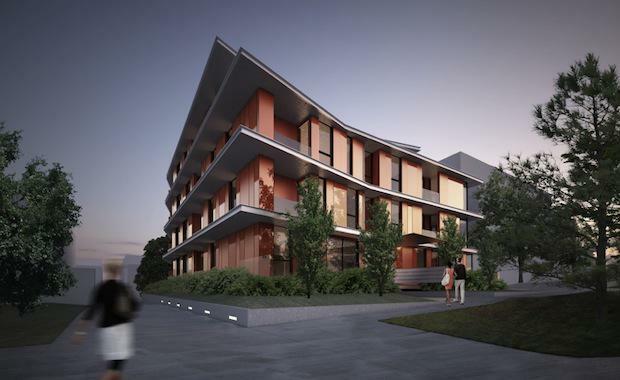 The third development at, 12-14 Queen Street, comprises 48 apartments and is under consideration by the City of Whitehorse with commencement on design development expected to commence in 2015.